I turned professional at 37 whilst working 50 hours a week, raced in the Tour of Oman & Tour of Qatar at 40, won three Singapore national championships, the Points Classification at the 2.1 Tour de Taiwan 2012, then became a race co-organiser (Mongolia Bike Challenge & Taiwan KOM Challenge), then a coach. 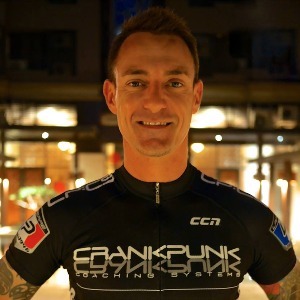 I am the official coaching provider for the Taiwan Cyclist Federation (I live in Taiwan) and also run www.crankpunk.com, whilst contributing articles to several leading cycling websites. I'm also official coaching provider for Everesting. I have a huge passion for coaching and get a bigger kick from my folks achieving their goals than I do when I win a race. I feel that watts and power meters have their place and but are not absolutely essential in the process of getting stronger, and I encourage riders to become a more intuitive in day-to-day training and in their racing. There's no greater feeling than when you have The Flow - that feeling where you are in full control of what is going on around you and instinctively know where your form is at, when to push on and when to ease off. My coaching style involves a lot of communication and I enjoy building a relationship with my clients. The beauty of cycling is that no one can stop you from improving but you. I know how to get you stronger than you've ever been before, and to get you riding with a smile on your face - in between the suffering, naturally! Just you and your bike, a passion for riding and a desire to improve. Success. Coach Lee Rodgers has been notified of your message.